Looking for the best salsa to dip your tortilla chips in? Then you'll love Ozganics Organic Medium Salsa for its rich and chunky texture that's loaded with the best organic ingredients. 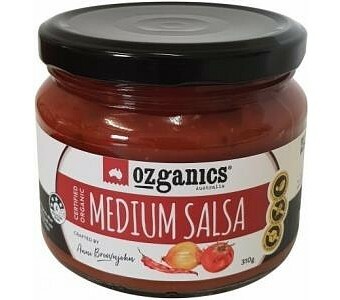 Ozganics Medium Salsa was prepared in a traditional style that contains the sweetness of ripe, full-bodied organic tomatoes along with a splash of organic red chilli to give it that hint of spice. Makes a great party dip that you'll love to share or enjoy it as a condiment with other dishes or salads. Gluten free No added sugar Perfect as a dip or condiment Ingredients: Certified organic tomatoes 90.2% (reconstituted tomato puree, diced tomatoes), certified organic onion, natural corn starch, certified organic chilli, sea salt, certified organic garlic, certified organic herbs and spices, vegetable gum (xanthan), food acid (citric).